Monsanto’s GMO products distort nature’s foods in ways that can now rewire your body and have been shown in animal tests to cause sterility, illness and death. In the U.S., GMOs can be snuck into our bodies because they don’t yet have to be labeled. Under the new “Monsanto Protection Act” GMO crops can be planted and grown without courts stopping them, even if there is evidence of danger (see Section 735 of H.R. 933), until an Environmental Impact Statement (EIS) is prepared — which can take years. The Monsanto “rider” (Section 735) was snuck into a 240-page government funding bill and was hidden so most politicians, who rarely read the actual bills, probably did not even know it was there. To date, no one in Congress claims ownership of Section 735, though speculation is emerging that Roy Blunt, a Senator from Missouri, is responsible. Blunt has serious financial ties to Monsanto. Monsanto’s home state is Missouri. 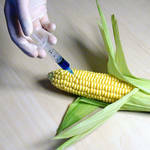 Learn more about GMOs, and what you can do to stop them. Follow the money behind GMOs, the Rockefeller’s, and government ties with Monsanto.